What food best represents Arizona? 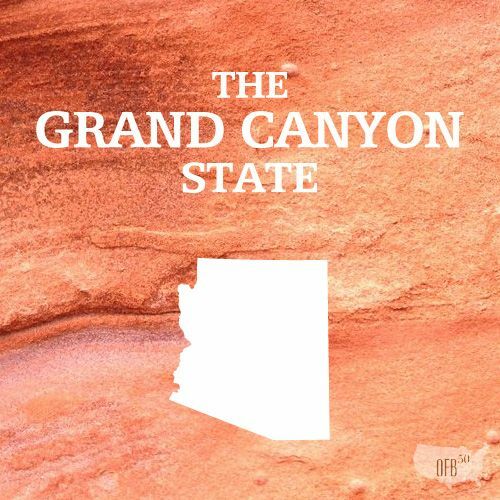 What song best represents Arizona? How does AZ refer to a carbonated beverage drink? If you could take a friend to one place in AZ, where would it be? Best aspect about living in AZ? Worst aspect about living in AZ? Summarize your feelings about Arizona in five words. Neither Johnny nor I have ever lived in Arizona before. I did stop in Flagstaff when I was a teenager, and I remember thinking it was pretty darn beautiful. Arizona has always intrigued Johnny and me because of the possibility of warm (okay, reallly hot) weather year round. And it seems like a state that offers a big buncha outdoor opportunities. 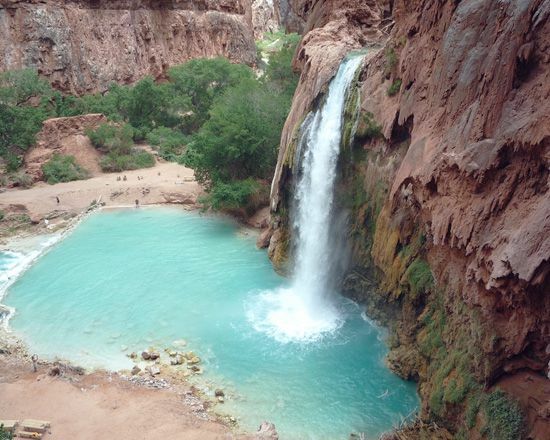 Now that we’re going to be living in a state that borders Arizona, we’re considering a sans baby trip to Havasupai in the next year or so. Arizona is a definite consideration on our forever-place list. How did these answers line up with your perception of Arizona? 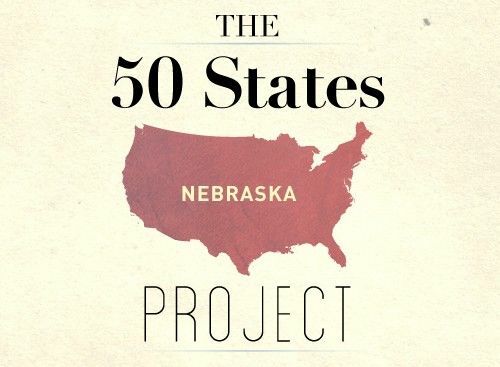 Have your thoughts on the state changed after reading this? Could you see it fitting your forever-place bill? I’ve been to Arizona a few times and would move there but that heat. I live in Chicago and much rather deal with a brutal winter. I visited Phoenix in the middle of July and I think that’s what changed my tune. The state is beautiful and a great place to visit. And as mentioned, they have In-n-Out. That’s where you and I differ! I’d take blistering heat any day over the blistering cold. But maybe we’ll try a mid-summer trip down there next year and see if it changes my tune, too! Mr PoP loves Bisbee and the mountains, but one of your contributors was right about the politicians. Jeez… Look up Fife Symington or Evan Mecham… Corruption used to feel like a requirement for the governorship there. Maybe when I’m about 70, AZ will feel like a better idea, but not now for me. Agreed, Mrs. PoP! I think Arizona has a lot to offer but the politicians completely take it off the top 10 list. Call me crazy, but Arizona seems to like to take extreme positions on sensitive issues and I don’t want to live in such a divisive place. It sure is pretty though! I would love to spend more time in Flagstaff. Megan, Flagstaff is amazing! Completely opposite of the rest of the state. I spent my undergrad studying there. Crazy! Glad it’s just DST you guys opt out of. Opting out of MLK JR Day would be really messed up! I’d never thought much about Arizona politics, but they do seem to always have quite a stance on political issues these days. In my opinion, the political corruption is widespread across this country unfortunately. It’s just a question of how apparent it is in some places compared to others! Can’t imagine a state with worse politics than New Jersey. I actually always thought good things of AZ – so some of these comments seem out of place to me. I certainly don’t think of AZ when the subject of “gun-crazies” come up. Didn’t realize it had that reputation? Unfortunately, there are a lot of ‘gun crazies’ here. We have gun shows where you don’t need an ID or background check to purchase a private-sell weapon, and Tucson had a horrific shooting involving Gabby Giffords a few years ago. Also, you don’t need a concealed license to carry a firearm…unless the public building specifically states ‘no guns allowed,’ people are allowed to conceal and carry anywhere. We own a shotgun and a Glock 40, but they are licensed, and were purchased with background checks. There is also a shooting range that refuses service to Obama supporters. But, of course, there are plenty of responsible gun owners as well! Yeah, me either. 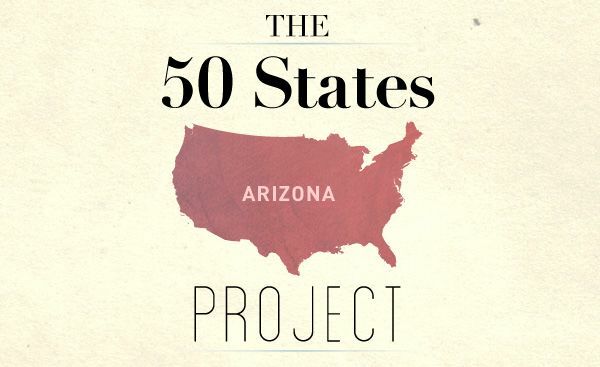 I think it’s because most other pro-gun states tend to fit other stereotypes, too, that Arizona doesn’t fall into. It’s interesting to hear Britt’s take as an Arizona resident, for sure! Meets my policital needs. I’m not crazy about the weather though. I’m trying to get away from the heat haha. I’ve never been to AZ. Just in the Phoenix airport. I would live there if I had a good enough job offer, but it isn’t in my top 10. It’s a dry heat…until monsoon season starts up during the summer. Just sayin’. And the dust storms…don’t want to get caught in those. When it comes to political issues the state as a whole seems to be comparitively tame with a few divisive issues. The immigration issue does need to be handled better by both sides. Overall I believe that Az is not nearly as extreme as the media would have everyone believe. Just my opinion. Our local university, ASU, has a part in the Mars rover program. I once had a college instructor who was involved with that who showed us a video of Martian dust devils. (Apparently they can be used to blow dust off of the rover’s solar panels if done from the right distance.) I’ve also heard that the research and development sector is strong here. To top everything off there’s the sights. The various mountains and parks, great views of the valley, the Painted Desert, old Indian ruins that can be visited. Plenty to see. Before you go to Havasupi Falls read up a good bit about how to get there, what to expect, what to bring, where to stay. I never went as I have horrendous knees and wasn’t sure I could handle the 11 or so mile hike from the nearest road to the falls (I could do it, I might not be able to walk the next day). Yelp has some good reccs and pointers. There are some options with guides and help from mules. Also, it’s on the Havasupi Nation so there may be some access fees as well. I don’t think its anything you couldn’t handle but just be sure to plan well before you go. Lots of my friends have been and all say it is absolutely amazing! Apologies if you have researched it already, just wanted to give fair warning if you hadn’t. No, we haven’t researched it yet, so thanks for the tips! All I knew was that it was a fairly long hike in, and Johnny mentioned that someone told him you have to book months in advance. But, oh how beautiful it looks. I think I’ll also have to get in much better shape than I’m in now before we do it… 11 miles is a much further walk than my half mile stroll with the baby each day! Several years ago, I hiked down into the Grand Canyon. I scoffed at the couple who had ski pole-type walking sticks the whole way down, and then marveled at how brilliant they were on my way back up. Canyon hiking is murder on the knees, and I now can see how nice it would be to use those poles! By the way, I’ve lived in Arizona my entire life: metro-Phoenix area growing up and now, and Flagstaff for college. I think a major issue with Arizona, especially the Phoenix area, is that since most people are from somewhere else, there’s a limited sense of community. Everyone identifies with their own hometown or home state and doesn’t really bond with their neighbors or participate in politics (which allows the crazies to rule). My family is considered a “territorial” family because we were here before Arizona became a state in 1912. (My grandfather was born in Tombstone in 1909.) There aren’t very many of us that can say our family has been in Arizona for over a hundred years. I doubt most people have been here for more than 10! I have lived a good 15 years of my life there. I escaped in 2008 to sunny So-Cal but I go back at least once a year. My mom lives outside of Sedona. Sedona is beautiful. I got bored of it when I lived there, but now I see the beauty again. 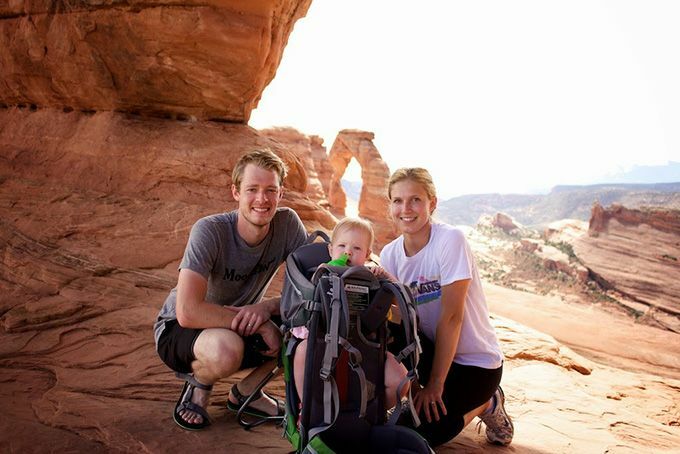 I really miss hiking those red rocks (when it’s not 100+ degrees). I’d recommend anyone to go to Sedona at least to visit. There is a mix of wealthy people, hippies, new-age, and just normal people. I can say from my expierence they are all mostly lovely. Phoenix has a very high crime rate (and I can vouch for this, being a victim of someone attempting to carjack the car I was in. 5 years outside of LA and this has NEVER happened to me here *knocks on wood*) and the monsoons will kill you. Arizona’s hottest weather is usually late afternoon which is also when the majoritiy of the monsoons hit. So then not only is it 105 it’s now humid. Awesome. Jobs are also relitively low paying, at least that’s what I’ve heard (and expierienced) from my friends over there. Politics wise, well I’ll just be nice and say I’ll agree to disagree and leave it at that. Guns are guns. They are easier to obtain in AZ. You can get a conceal carry permit. There are pros and cons to gun ownership and that topic is beyond the scope of this comment. Rent wise is cheap, but not as cheap as some of the other more southern states such as Texas (where I was born). As anywhere weigh the pro’s and con’s of any move. See ya’ll in Arizona! or California. Wherever I happen to be! Thanks for adding your 2 cents, Brandy. From the photos we’ve seen of Sedona, it definitely looks like a must-visit. We’re hoping to get more in touch with our nature-side this spring/summer, and Sedona should make our road trip list.